Lightweight. Functional. Ready to travel. Whether you’re going to church, heading to work, or touring the globe, the NIV Thinline Bible is ready to go with you. Its size makes it easy to keep God’s Word at hand, no matter where life takes you. 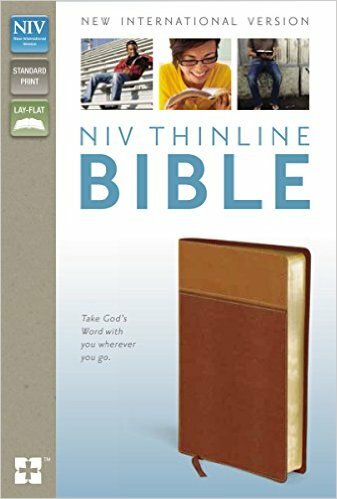 Features: • Extra-thin edition—less than one inch thick • Presentation page—ideal for gift giving • Words of Christ in red • Ribbon marker Testimonials: “The overall size and format is perfect for an everyday carry-along Bible. It is perfect for home, work, or church and Sunday school. The thinness of the Bible is just right.” —Melissa “This is my first Bible, and I wanted it to be well made and something I could see being with me for many years—and it is! Having Christ’s words in red and the NIV translation make this Bible nothing short of satisfying.” —Sarah “I’ve found this to be the most convenient Bible I’ve ever had. It is easy to hold and read, easy to find passages, and it’s a cinch to transport ,1152 pages.